You’ll be able to carry out professional Indian Head Massage in Britain and internationally. Your qualification will be instantly recognisable within the National Health Sector. You’ll hold lifelong massage skills to work in a successful practice in a variety of environments. You will hold a highly acclaimed Indian Head Massage qualification when you study with Richdales. Our Indian head massage courses adhere to the ITEC QCF (Qualifications Credit Framework) syllabus which was introduced by the UK Government in September 2009. Firstly, your qualification will be automatically registered on the upcoming National Register for Complementary Medicine. Secondly, you’ll be able to work within the National Health Sector, join any leading professional association and be part of the Complementary & Natural Healthcare Council. And finally (and this is something that many training providers don’t take into account!) you’ll never have any problems getting your qualification recognised in the future! What you learn now will give you all the skills you need to practise Indian Head Massage in any environment that you choose. So what exactly will you learn? You will learn the principles of Ayurvedic medicine, how to assess the Ayurvedic Doshas and the benefits of Ayurvedic Oils. You will also learn Marma points on the head and face as well as performing and adapting Indian head massage techniques correctly and safely to meet the individual needs of your clients. You will be able to confidently identify factors that may influence your treatment objectives as well as provide clear recommendations to your client. You will learn when and how to treat a person holistically, and also importantly when not to treat. You will also learn how to build your professional practice ethically. You will also learn to perform the treatment without any oils so that it can be used as therapeutic head, neck and shoulder massage in a corporate environment. As the treatment does not require any special equipment (apart from an ordinary chair) it is the ideal treatment to take into a working office environment as well as a treatment that can be easily performed at exhibitions, fairs etc. (These are great places to promote your practice, by the way!). Our Indian Head Massage courses boast a 100% pass rate! Click on Dates/Venues/Fees/Enrol to choose and enrol on the right course for you. We take a maximum of 12 students per class. You get that individual attention at Richdales! Take a look at our timetables and you will notice a big difference to most other courses. And that one distinction is that our timetables are structured around you. 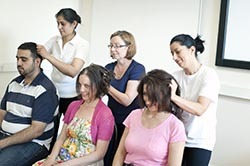 We’ve been teaching Indian Head Massage courses in West London for over 25 years and we know that many of you will be looking for a course that fits around your other commitments. That’s why we run the course over 4 Days over 2-3 months. This gives you plenty of time to understand the material being taught without having the put the rest of your life on hold. We also recognise that student feedback is our most valuable resource. So, we structure our courses around what is proven to work best for the majority of our students. If you want to develop a career in Indian Head Massage (or even just a hobby) and are worried about a lack of time, don’t be! We respect that many of our students have jobs, commitments and busy schedules. So, we run our courses over a longer period, with spaces in between, to suit your existing lifestyle. It is this commitment that has enabled us to hold a proven track record in helping students become professional Indian Head Massage therapists. But don’t just take our word for it. Read what our students have to say or come and watch an actual class in progress and meet some of our current students. Curious to find out more? Contact us now for a friendly chat. Practitioner wanting to become fully qualified Indian Head Massage Therapist and practice professionally in private practice or with the NHS and set up their own practice or work in a multidiscplinary or corporate environment. Healthcare Professionals who wish to add to their skills. Practitioners who want to develop and expand their career in Complementary Medicine. 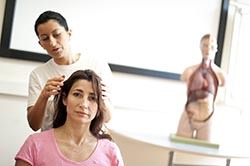 In order to gain the ITEC Certificate in Indian Head Massage you have to hold a recognised qualification in Anatomy, Physiology & Pathology and Business Practice, Health, Safety & Hygiene. As these modules are integrated in the ITEC Diploma in Massage, Aromatherapy and Reflexology Courses it is strongly suggested you undertake the Indian Head Massage Course after completing the Massage, Reflexology or Aromatherapy Courses. We have had students who only wish to practise Indian Head Massage in a professional capacity. This is possible. Please contact the Office so that we can discuss this further with you. Anatomy & Physiology of head, neck and shoulders. Diseases & disorders of head, neck and shoulders. Principles of Indian Head Massage. History, theory and development of Indian Head Massage. How to perform an effective Indian Head Massage. Physiological and psychological effects of Indian Head Massage. Beneficial qualities and selection of specific oils. Contra – indications to Indian Head Massage. Create, evaluate and review Indian Head Massage treatment – programmes. Introduction to Acupressure points of the head, neck and shoulders. Marma points of the Head, Face and Arms. How to look after yourself as a therapist. This is demonstrated by the fact that we have never had a student fail an ITEC Practical or Theory Examination in Indian Head Massage. 100% of the students rated their course as Excellent (50%) or Very Good (50%). You get all you need and it all falls into place in time for the exam. June 2017. It is taught by a knowledgeable instructor. June 2017. The teaching was excellent. April 2017. Well organised & informative. Great teaching. April 2017. Thorough content. Kind, friendly & understanding staff. April 2017. Very enjoyable. Extremely knowledgeable and experienced tutor. 100% recommended. Quality course and quality teaching. Very good course and you don’t need much equipment for it. Excellent tutor, friendly and experienced. Also a good group of students. The tutor was excellent and the instructions very clear. Lots of hands-on experience and a small class size. Tutor is excellent and approachable. A great communicator with excellent knowledge. Nanette is a good teacher so I enjoyed her “style”. It was a good course. I would recommend this course. Good teachers, lovely location with support on hand. Plenty of info on Moodle. Enjoyed the course – all aspects of it. I have now got skill in IHM and more knowledge . It’s very rewarding and a short course to fit in when working full time. Got some questions that need answering? Take a look through our commonly asked questions below. If you can’t find what you’re looking for, give us a call or send us an email and we’ll be happy to help. I want to learn about Indian head massage to start a new hobby. Can I still join the course? Most of our students are qualified Massage Practitioners, Reflexologists or Aromatherapists who looking to further develop and expand their skills in Complementary Medicine. We do have some students who only want to practice Indian Head Massage professionally. If this is your case then please contact the office so we can discuss how you can obtain your qualification. We do have some students who do not want to practise professionally but just want to be able to treat friends and family as a hobby. If this is you and you want the best training available then we look forward to you joining the course. Do I need to bring a model with me? No. We provide all the equipment you need for the course. Do I need any qualifications to get on the course? If you only wish to practise Indian Head Massage in a professional capacity, please contact the office so that we can identify the best training path for you. Are the course tutors fully qualified? Absolutely! Our tutors are all experts in their fields with vast knowledge and experience. For your added benefit, you’ll be taught by a different expert for each specific sector of the course. There’s not a stone left un-turned at Richdales. You’re guaranteed of the best learning experience available. Is there additional support available if I need it? Yes. One of the advantages of studying with us is there are opportunities for you come in for additional support outside of your scheduled attendance weekends if necessary. We are here to support you as much as you need us. It’s up to you - you can pay by cash, bank transfer or cheque. Or, to make things even easier for you, we also take debit or credit card payment without additional charges. If you’d prefer, you can spread the cost of your training by paying us in agreed regular instalments. If, on the other hand, you wish to pay in one payment you can receive a significant discount. Our courses start in the September and February of each Academic Year. Take a look at our course dates and select the date that suits you. Nanette is overall responsible for the Indian Head Massage students. Nanette teaches the Indian Head Massage modules and will be one of the Institute Examiners.